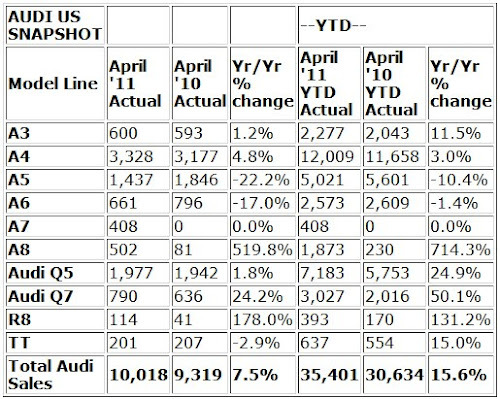 Marking the fourth consecutive record month of 2011, Audi is reporting the brand's best-ever April U.S. sales. Helping fuel Audi's stellar growth was the debut of the all-new A7 and continued demand for the new A8 (up 519.8% from a year earlier); adding up to a 7.5 percent increase over the same period last year. In addition to strong new car sales, Audi Certified Pre-Owned sales also recorded the best month in company history. Full report after the jump. HERNDON, Va., May 2, 2011 - Audi today added to its 2011 momentum story with record-setting April U.S. sales of 10,018 luxury vehicles. Sales for the most recent month surpassed the prior April record set in 2010 of 9,319 vehicles, or 7.5 percent. Through the first four months of 2011, Audi sales increased 15.6% to 35,401 vehicles. The record April 2011 results follow the best first quarter in company history as the automaker enjoyed a steady quarter-over-quarter sales increase of nearly 20%, compared to the previous period in 2010. April 2011 sales not only marked the fourth-straight monthly record for 2011, but also the third time in company history where vehicles sales exceeded 10,000 units in a given month. The strong results were buoyed by the continued strong public response to the 2011 Audi A8 flagship model, which set a sales increase of 519.8% from a year earlier. Another big factor came from the recent introduction of the all-new 2012 Audi A7. Additionally, clean diesel sales continued to reflect the surging demand for fuel-efficient models as the Audi A3 TDI® and the Audi Q7 TDI accounted for 61% and 47% in their vehicle lines, respectively. 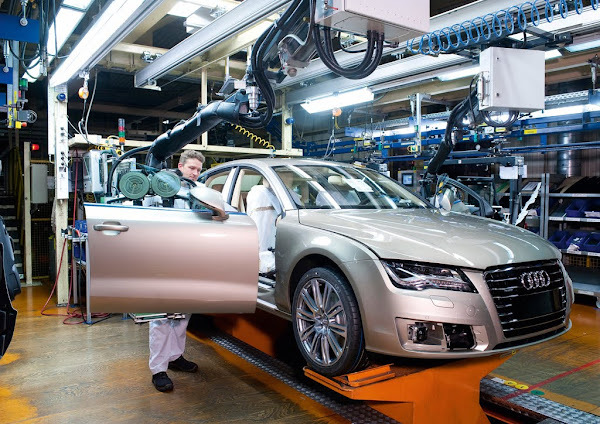 In April 2011, Audi recorded year-over-year sales increases with six of its models: the Audi A3, the Audi A4, the Audi A8, Audi Q5, Audi Q7, and the Audi R8. Audi Q7 full-size luxury crossover sales posted a 24.2% increase over April 2010 sales. • April 2011 ranks as the best-ever April sales in Audi of America history; also represents fourth consecutive month of record-setting achievements. • Six models within Audi lineup post YOY gains. • All-new 2012 Audi A7 posts strong sales in U.S. debut. 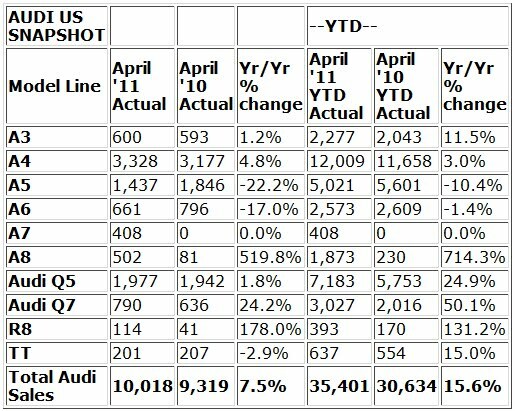 • Month-to-month Audi sales increase by 200 units over March 2011, and 7.5% YOY increase compared to April 2010. • Audi Q5 sales in April second only to A4. • Audi Q5 sales up 24.9% year-to-date, compared to 2010. • Audi Q7 sales up 24.2% for April YOY. • TDI clean diesel technology represented in 47% of total Q7 sales for April. • Audi A3 sales increase by 11.5% year-to-date from same period in 2010. • TDI clean diesel technology represented in 61% of total A3 sales for April. • R8 sales record 178% uptick over April 2010 on strong demand for the Audi R8 Spyder. • Certified Pre-Owned sales of 3,609 vehicles marks the best month for Audi CPO in company history, surpassing the previous sales record of 3,364 set back in May 2008. • April 2011 CPO sales of 3,609 units represent 57.6% YOY surge from 2,285 vehicles a year earlier; increase in sales fueled by strong A4 sales mix. • Record-setting CPO markets in April: East up nearly 60% year-over-year growth compared to 2010; South up 50% YOY growth compared to 2010; and West up nearly 65% YOY growth compared to 2010.